"He's been through more than you can imagine." Our story begins in a bright, idealistic place that could only exist in the mind of a child. The boy's name is Ivan (Nikolai Burlyayev), and he runs over to join his mom and admire the pristine outdoor landscape. There's nothing to suggest that we are not witnessing a real moment taking place in the present. Yet this is only the dream (or memory) of a boy struggling to survive the horrors of war. Waking up in a dirty shack, Ivan wades through nasty water and avoids detection from the German enemy. Although only 12 years old, his youthful innocence is gone�replaced by a hardened desire for revenge. Malnourished and unwashed, he dreams of the past but must face the grim realities of his present state. Determined to battle the Germans and avenge his family, Ivan struggles to fight like an adult and cares little about the consequences. Released in 1962, Ivan's Childhood is most notable because it was directed by Andrei Tarkovsky, one of Russia's most renowned directors. As part of Russian cinema's "Thaw" period following the death of Stalin, he rose to prominence in the early 1960s. Known mostly for later films like the original Solaris and Stalker, the unique filmmaker had already begun to develop his signature style in this picture. It may lack the slow-moving, extremely long shots of his epics, but it does include sharp visuals that shock within a minimalist setting. Certain shots do still last for several minutes, which feel very long in today's quick-cutting, Michael Bay world. Tarkovsky employs clever stylistic contrasts between the dream and war sequences that make a point without being too obvious. When Ivan's joyous reverie dramatically shifts into gritty reality, we observe the violent removal of his childhood. When the Germans killed his father, mother, and sister, Ivan became an unwilling adult and can only have visions about a brighter time. Based on the short story Ivan by Vladimir Bogomolov, the plot follows Ivan as he scouts for the Russian army and observes the depressing war environment. Tarkovsky was not a big fan of the original story and made significant changes during production. He added the surreal dream sequences and a completely unnecessary love story. That romance involves Captain Kholin (Valentin Zubkov)�an adult mentor for Ivan who faces his own personal troubles. The scene with him wooing the attractive Masha (Valentina Malyavina) includes some impressive cinematography, but it feels out of place within Ivan's story. The disjointed narrative was Tarkovsky's purposeful creation and supports the main character's troubled persona. However, it also takes us out of the story and makes the final acts more confusing. When the soldiers join Ivan for a scouting trip down the river, their ultimate fate is confusing. It all makes sense when you learn some background, but can be puzzling during the original viewing. The highlights are the boy's dream sequences, which usually end with a jarring shift into the sad present. Innocent images of fruits, the beach, and games like hide and seek reveal a more typical childhood that no longer exists. Another remarkable sequence involves Ivan's discovery of messages scribbled on the wall from doomed victims. Tarkovsky cuts between shots of the prisoners and Ivan's flashlight to create a powerful anti-war message. These sentiments are never overdone or obvious, but they are hard to miss within the dreary atmosphere. By exploring the inner workings of a child's mind, this picture decries the devastating effects of war. The soldiers try to maintain their humanity by listening to the phonograph and pursuing romance, but little can save their weary souls. Even when the Russians emerge victorious, their success feels hollow when you consider the tremendous loss. Although the story is a bit jumbled, Tarkovsky's original direction makes it a worthy choice. He would reach even greater heights with his future work, but still delivers an interesting portrayal of a stolen youth. Image Transfer Review: Criterion has delivered again with this sharp black-and-white transfer. The presentation showcases Tarkovsky's unique style and the rough landscapes of war. The picture quality does not feel dated and remains strong throughout the feature. The shifts in brightness that often appear during older films do not occur. Audio Transfer Review: Ivan's Childhood includes a digitally remastered mono transfer in Russian (with English subtitles). There are some jarring sound effects, particularly during the dream sequences, which do remain sharp on this centrally focused track. Its complexity is obviously limited, but the restrictions aren't easily noticeable. The war scenes also remain memorable even when you consider the technological limitations. 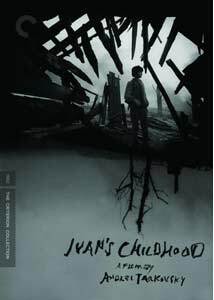 Extras Review: This Criterion Collection release of Ivan's Childhood includes an informative group of extras that give insight into the anti-war picture. The primary feature is Life as a Dream, a 30-minute video appreciation from film scholar and writer Vida J. Johnson. The co-author of The Films of Andrei Tarkovsky: A Visual Fugue, she describes the director's background and his film's basic characteristics. I was fairly confused by the last act of this picture, and Johnson offers some good examples that illuminate its contents. She also discusses the difficulties in getting a film approved by Russia's government during the 1960s. The other major features are interviews with Nikolai Burlyaev (Ivan) and cinematographer Vadim Yusov, each lasting about 11 minutes. Burlyaev's comments are split into five chapters and show his admiration for Tarkovsky. The most interesting piece talks about his difficulty in finding tears and the help he received on that count from the director. Yusov's comments are split into four chapters and more technical in nature. They cover the visual language, preparation, dreams, and textures in the picture. There's also the type of informative booklet of essays that Criterion always does so well. This insert contains the article Dream Come True by Dina Iordanova, professor and chair of film studies at the University of St. Andrews in Scotland. It also includes a 1962 essay by Tarkovksy called Between Two Films that describes his thoughts on the picture. The final inclusion is the short poem Ivan's Willow, which was actually written by the director's father, Arseny Tarkovsky. It was not used directly in the film, but does have some striking connections. Andrei Tarkovsky stepped in for another director to create Ivan's Childhood, but he definitely placed a personal stamp on this memorable picture. It's an early work and contains a jumbled plot, but we do see the growing confidence of a classic filmmaker. This might not be your best first choice to begin exploring Tarkovsky's work, but it is a worthy picture for completists and cinephiles interested in Russian cinema.